Shea Norwood is a West Texas native that currently lives in the DFW area with his wife and son. He's an avid reader and enjoys the craft of writing. The fictional town of Dust is loosely based on a small town south of Odessa, TX. 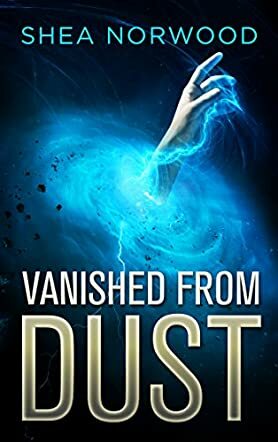 Vanished From Dust by Shea Norwood is a paranormal adventure that follows the exploits of Eric and Kyle, two eighth-graders in the little town of Dust, Texas. Eric is an average boy, but has recently been bullied in school after a few episodes of strange behaviour. Eric claims he has seen phantom figures haunting him in various places around the town, but everyone else thinks he’s crazy. Only Kyle, his best friend, will stand by him and help Eric pursue the truth about the phantoms. The plot progresses as the two boys attempt to discover the truth behind Eric’s visions, unravelling a much larger mystery that dates back over sixty years along the way. Vanished From Dust is well-written and vividly detailed. The first half of the plot is slow moving as it illustrates Eric’s difficult life at school, his friendship with Kyle, and his growing sense of paranoia that something strange is about to happen to him. A varied cast of characters at school and in the town of Dust populate the story, feeding the boys information that leads them to follow the trail of a girl who vanished several years ago. It is only when they venture out to Dust Mountain that the paranormal element of the plot swings into its full effect, plunging them into a new and dangerous world. Shea Norwood has created a fascinating concept and a very realistic town; the ending of this novel certainly leaves everything open for a sequel, but for me it didn’t tie up enough loose ends to really feel satisfied with the result.